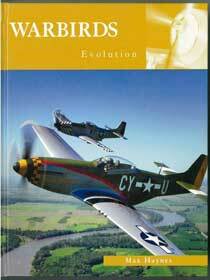 Warbirds Evolution book is a photographic history, in color, spanning a century of innovation in military aviation. Warbird Evolution features 40 of Americaï¿½s greatest combat aircraft from WWI, WWII through to the modern era. Book also includes several foreign warbirds. Collection captures the ï¿½greatest generationï¿½ of Warbirds: B-17s, B-24s, P-38s, P-47s, P-51s, transports, trainers, bombers, and fighters: close-up at rest or flashing in action by a premiere air-to-air photographer. Detailed info on each pictured aircraft: its pilot, its crew, and its unique history thereby making this book the ultimate reference and resource on combat aircraft. WWI: Fokker D.VII, Nieuport 28, S.E. 5A, Sopwith Camel and Pup. WWII: A-26, A6M2, AT-6, B-17, B-24, B-25, B-29, Bf 109, BT-13, C-45, C-47, F4F, F4U, F6F, Fw190, J2F, J4F, L-5, P-40, P-47, P-51, P-64, PBY, I-16, SBD-5, Spitfire, TBM. Post WWII: AC-47, A-1H, AN-2, DHC-1, F-4, F8F, FJ-4B, F-86, L-17, OV-1, P-82, S-2, T-28. Today: A-10, AV-8B, C-5, C-130, CH-46, F-117, F/A-18.